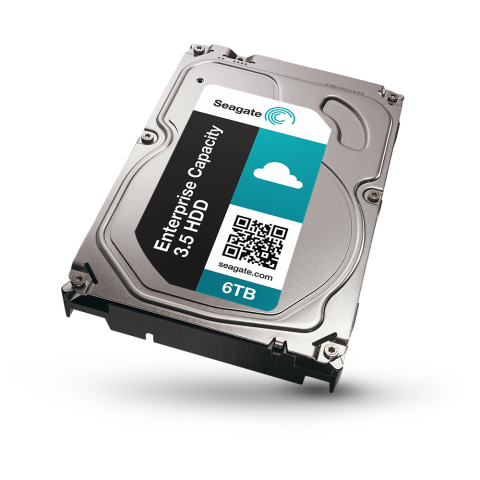 CUPERTINO, Calif.--(BUSINESS WIRE)--Seagate Technology plc (NASDAQ:STX), a world leader in storage solutions, today announced it is now shipping the world’s fastest 6TB hard disk drive (HDD) — the Seagate® Enterprise Capacity 3.5 HDD v4. Boasting industry-leading performance, the Enterprise Capacity 3.5 HDD v4 is an important step forward in scale-out data infrastructures delivering supersize storage and enterprise reliability to meet the explosive growth of corporate and cloud-based data centers. Featuring the fastest performance available for a nearline HDD, the Enterprise Capacity 3.5 HDD v4 enables faster data transfers by building on an eighth-generation platform that enables the drive to deliver up to a 25 percent increase in performance over competing 6TB drives — making it ideal for 24 X 7 bulk data storage. Utilizing the latest generation of 12Gb/s SAS, the drive provides customers with the scalability for future-proofing their systems. It is also available in an enterprise-ready SATA 6Gb/s interface for easy system integration. The drive employs multi-drive rotational vibration tolerance for consistent enterprise-class performance and accurate data storage in high density environments. With its robust 7200-RPM performance, ramp load technology, and a humidity sensor, it delivers optimum performance even in the harshest environments. Purpose-built for enterprise environments, the drive utilizes the T10 and T13-compliant power management standards enabling organizations to tailor systems for optimal energy usage resulting in up to 90 percent more power savings. Industry-Leading Performance— 25 percent faster than competitive 6TB drives. Highest Capacity Available—Up to 6TB per drive for maximum density server and storage solutions. Enterprise-Class Reliability— Industry-leading rotational vibration tolerance for consistent performance and enhanced error correction for accurate data storage. Best-in-Class Security— Self-Encrypting Drives (SED) with Instant Secure Erase for easy drive disposal or repurposing and FIPS SED security options. The drive is shipping now to select Cloud partners and resellers globally. It will also be integrated into Seagate business and branded storage products starting this spring. To learn more about the Seagate Enterprise Capacity 3.5 HDD v4 please visit http://seagate.com/www/6TB_Drive. “QNAP is excited to offer support for Seagate’s new 6TB Enterprise Capacity 3.5 HDD v4 to our users. With 50 percent greater storage density and optimized performance for nearline workloads, it is ideal for meeting the needs of our cloud data center customers who demand optimized hardware for their unique workloads as well as our high capacity SAS-enabled Turbo NAS users who demand high capacity and high reliability data storage,” said Meiji Chang, general manager of QNAP. “Synology is very pleased to be working with Seagate on enhancing its device offerings. The integration of Seagate’s new 6TB Enterprise Capacity 3.5 HDD v4 into our upcoming product lines will help us provide our customers with faster access to their content while offering a new set of increased capacities,” said Alex Wang, CEO of Synology, Inc.
Seagate is a world leader in storage solutions. Learn more at www.seagate.com. Follow Seagate on Twitter, Facebook, Google +, YouTube, Instagram and subscribe to our blog. Copyright 2014 Seagate Technology LLC. All rights reserved. Printed in the United States of America. Seagate, Seagate Technology and the Wave logo are trademarks or registered trademarks of Seagate Technology LLC in the United States and/or other countries. When referring to drive capacity, one terabyte, or TB, equals one thousand billion bytes. Your computer’s operating system may use a different standard of measurement and report a lower capacity. In addition, some of the listed capacity is used for formatting and other functions and will not be available for data storage. 1 Source: IDC, “Where in the World Is Storage: A Look at Byte Density Across the Globe”IDC Doc# 243338, October 2013. Seagate Technology today announced it is now shipping the world's fastest 6TB hard disk drive -- the Seagate Enterprise Capacity 3.5 HDD v4.